The London Double Vanity Cabinets with Make-Up Table is 90 inches in total length and is constructed with solid wood. 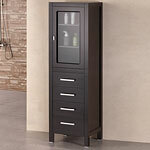 The storage in this free-standing vanity includes one flip-down shelf and one double door cabinet accented with brushed nickel hardware in each 30 inch vanity bridged with a single drawer make-up table with seat. The set includes two 30 inch vanities, white carrera marble countertops with white porcelain sinks, pop-up drains, matching mirrors and make-up table. Each vanity includes one flip down panel, double door cabinet, satin nickel finish.